At 9.27 pm on Sunday 27 January, a star-crossed bulk iron ore carrier, the Lake Illawarra, struck Hobart’s Tasman Bridge, knocking over two of its concrete pylons along with 127 metres of road that they had supported. The consequences were devastating and immediate: five people in cars plummeted to their deaths in the Derwent River when they drove off the bridge into the gaping hole where road had been, and falling debris crushed seven crewmembers on the vessel below. One maritime pilot, Digby Longhurst, has lamented that the Lake Illawarra was unpiloted on that fateful night. Pilots like Longhurst were paid to board ships solely to guide them safely into port, using their unique knowledge of the port, water conditions and different vessels. In 1975, vessels entering the port required a pilot to board to help guide them in safely, but because the Lake Illawarra’s captain had navigated the port in the two years preceding the incident, that vessel was exempt. Ship owners preferred to take the exemption rather than use a pilot’s services, because it saved money and gave the resident captain the chance to build their experience. So what precipitated this disaster? An inquiry found that erratic river currents and crew inattention were to blame. Ultimately the collision occurred because the carrier had veered dangerously off course, and the crew registered the egregious mistake all too late. The ship was fitted with an ‘off course alarm’, which was displayed at the incident’s 40th anniversary exhibition. Today it remains unclear whether the alarm sounded but was not heard, malfunctioned, or was responded to too late. Ferry services were running between river banks within hours of the bridge’s collapse and a temporary bridge section was erected a year later; however, the Tasman Bridge took nearly three years to fully rebuild, during which time its banks saw considerable change. 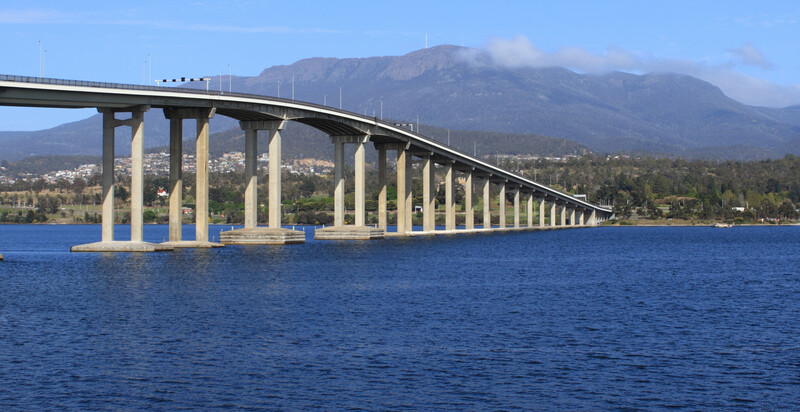 The separation of Hobart’s eastern shore meant that its inhabitants could no longer duck across to Hobart for provisions and entertainment. Shopping centres, schools, health centres and other infrastructure cropped up to cater for the 30 per cent of Hobart’s population who called the eastern shore home. In 2015, a ceremony was held to commemorate the 40th anniversary of the deadly collision, and a memorial has been erected in tribute to the victims.